External dimensions as per 'ER' Collets DIN - 6499. 'T' stands for tension or expansion. 'ERT' has no compression,so it has always rigid start.Best suitable for depth control in tapping. CNC Turn - Mill centers with rotating tool holders. 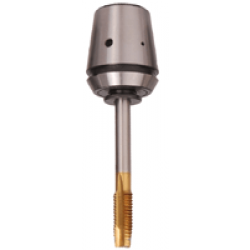 CNC machining centers & any CNC machine where tapping is involved. This is available in 16,20,25,32,40,&50 sizes.To be used with standard 'ER' Collet chucks.Need not to have any special Holding device. Rapid approach,then feed the Tap with approximately 95% of the pitch value,this gives positive start to the Tapping.This uses 20% to 30% of the compensation stroke. When the spindle rotation & the feed movement are simultaneously reversed.Return feed must be made 100% of the pitch value.Which maintains the sleeve of the tapping collet in the expansion stroke upto the Tap disengagement.When Tapping with very high speed , an appropriate programming,compensation may be necessary to balancethe differences of inertia between the spindle & the feed movement on reverse.Never disturb the axial compensation.Use internal coolant supply only. What is Quick Change Expansion Tap Collets? Where can I buy Quick Change Expansion Tap Collets Online?